During April 2018, Scripps University measured an average of 410.26 ppm CO2 concentration at the Mauna Loa, Hawai’i Observatory. This value is important. Why? Because 410.26 ppm is the largest CO2 concentration value for any April in recorded history. The unending trend toward higher concentrations with time, no matter the month or specific year-over-year value, as seen in the graphs below, is more significant. When I wrote about this topic a few years ago, there were no monthly or annual CO2 averages that exceeded 400 ppm. In the intervening time, concentrations passed that threshold. Actually, monthly CO2 concentrations have not fallen below 400 ppm since Jan 2016; the same thing can be said for annual concentrations since 2015. How do concentration measurements change during calendar years? The following two graphs demonstrate this. Figure 1 – Monthly CO2 concentration values (red) from 2014 through 2018 (NOAA). Monthly CO2 concentration values with seasonal cycle removed (black). Figure 2 – 60 year time series of CO2 concentrations at Mauna Loa Observatory. The red curve represents the seasonal cycle based on monthly average values. The black curve represents the data with the seasonal cycle removed to show the long-term trend. This graph shows the recent and ongoing increase in CO2 concentrations. Remember that as a greenhouse gas, CO2 increases the radiative forcing of the Earth, which increases the amount of energy in our climate system. CO2 concentrations are increasing at an increasing rate – not a good trend with respect to minimizing future warming. Natural systems are not equipped to remove CO2 emissions quickly from the atmosphere. Indeed, natural systems will take tens of thousands of years to remove the CO2 we emitted in the course of a couple short centuries. Human systems do not yet exist that remove CO2 from any medium (air or water) at a large enough scale to make a difference to planetary CO2 concentrations. CO2 removal systems are not likely to exist for some time. I’ve written a sentence like that for nearly a decade now. Unfortunately, NOAA will extend the right side of the above graphs for years and decades to come. CO2 concentrations rise when there is more CO2 emitted into the Earth system than removed from it. Recently, humans have only increased the CO2 emission rate, which means that CO2 concentrations have to rise, absent carbon sinks becoming more efficient. The rise in CO2 concentrations will slow down, stop, and reverse when we decide it will. It depends first and foremost on the rate at which we emit CO2 into the atmosphere. We can choose 400 ppm or 450 ppm or almost any other concentration target (350 ppm seems out of reach within the next couple hundred years). That choice is dependent on the type of policies we decide to implement. It is our current policy to burn fossil fuels because we think doing so is cheap, although current practices are massively inefficient and done without proper market signals. We will widely deploy clean sources of energy when they are cheap, the timing of which we have some control over. We will remove CO2 from the atmosphere if we have cheap and effective technologies and mechanisms to do so, which we also control to some degree. These future trends depend on today’s innovation and investment in research, development, and deployment. Categories: global warming, science | Tags: CO2 concentrations, Mauna Loa Observatory | Permalink. In the post-Paris Accord climate world, analysis of theoretical scenarios that have a reasonable likelihood of keeping global temperatures “only” 1.5°C warmer than pre-Industrial have become all the rage (one of the latest examples I’ve seen). I’ve written posts about the mythology associated with 2°C scenarios given the reality of countries’ CO2 emissions historically. Given that reality, 1.5°C scenarios reside further in the realm of fantasy. The primary reason is the lack of scalable technologies to remove CO2 from the atmosphere. That is not a judgment statement, it is an observation about how things exist in the real world. Theoretical studies have their utility. My ongoing anxiety revolves around policy makers’ dependence on those studies to inform their decision making. The resources required to deploy global-scale renewable or nuclear energy are mind-boggling enough. If we need to add to that infrastructure additional technologies that remove CO2 from the atmosphere, it strikes me as obvious that we need to be sober about our expectations to do so. To have any hope of a <2°C world, global CO2 emissions need to peak. They haven not done so as of 2017 and likely will not in 2018 or in the following handful of years, absent some financial or geopolitical disaster. The right hand time series is clear: if we continue emitting anywhere near 35-40 GTCO2 every year, it becomes increasingly likely global temperatures will rise to 3-4°C by 2100. The impacts are what policy makers are responsible for. And this infographic does not show what impacts are likely at 3°C or 4°C. We can attribute this lack of information to the aforementioned excessive focus on 1.5°C and 2°C by the research community. It will be hard to decide on climate policy moving forward if we are not appropriately informed about the risks that today’s decisions are locking in. A new commentary piece in Nature Climate Change continues to make significant errors and propagates a mistaken core assumption too many in the climate community make: that with enough [insert: political will or technological breakthroughs], 2C warming is still an achievable goal. I have disagreed with this assumption and therefore its conclusion for six years – ever since establishment Democrats decided to waste valuable political capital on a right-wing insurance bill with a vague promise that climate legislation would come someday. That decision essentially assured that, absent a global economic collapse or catastrophic geologic events, our species would easily push the planet past 2C warming. The following graphic shows global historical emissions in solid black. The green curve represents the fantasy projection of an emissions pathway that leads to <2C global warming. As you can see, emissions have to start declining this year in the assumed scenario. The yellow curve represents what is likely to happen if climate action is delayed for 8 years and this year’s emissions remain constant during those 8 years. It gets increasingly difficult to achieve the same long-term warming cap because of that 8 year delay. The red curve builds on the yellow curve projection by keeping the next 8 year’s emissions constant but reducing federal money to research decarbonization technology. This is the linchpin to any emissions pathway that could potentially put us on a pathway to a less warm climate. Decarbonization technology has to not only be fully researched but fully deployed on a planetary scale for the 2C pathway to happen. It’s hard to see on this graph, but global emissions have to go net negative for us to achieve <2C warming. While the yellow curve has a harder time achieving that than the green curve, the red curve doesn’t get there one century from now. But the red curve isn’t the most likely pathway – it wasn’t in 2010 and it isn’t today. The most likely pathway is the solid black curve out to 2125. 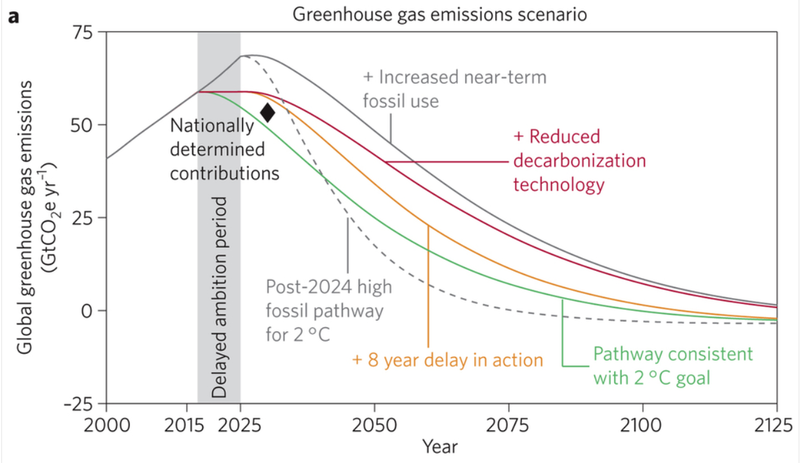 It assumes the same things as the red curve and adds an important component of reality: emissions are likely to increase in the near-term due to continued increased fossil fuel use. Natural gas and coal plants continue to be built – any assumption otherwise might be interesting academically but has no place in the real world. By assuming otherwise, scientists make themselves a target of future policy makers because the latter won’t pay attention to the nuanced arguments the scientists will make once it’s clear we’re hurtling past 2C. Once we burn increasing amounts of fossil fuels during the next 8 years (as we did the 8 years before that and so on), it is harder still to cut emissions fast enough to try to keep global warming <2C. The reasons should be obvious: the emitted GHGs will radiatively warm the planet so long as they’re in the atmosphere and it will take even more technological breakthroughs to achieve the level of carbon removal necessary to keep warming below some level. […]to remain within a carbon budget for 2 °C in the baseline scenario considered, peak reduction rates of CO2 emissions around 2.4% per year are needed starting mitigation now. A global delay of mitigation action of eight years increases that to 4.2% per year (black dashed in Fig. 1a) — extremely challenging both economically and technically. The only alternative would be an overshoot in temperature and negative emissions thereafter. Research in negative emissions should therefore be a priority, but near term policy should work under the assumption that such technology would not be available at large scale and low cost soon. Society is at a crossroad, and the decisions made in the US and elsewhere over the next 4–8 years may well determine if it is possible to limit climate change to levels agreed in Paris. We passed the crossroad already. It really doesn’t matter when, the fact is we passed it. I think it is a waste of time to examine low-end emission scenarios for policy purposes. They serve some scientific use. Policy makers need relevant scientific advice and 2C scenarios don’t do that. They perpetuate a myth and therefore pose a real danger to society. The so-called reality-based community needs to critically self-examine what they’re doing and why they’re doing it. We’re headed for >3C warming and we need to come to terms with what that means. Categories: environment, global warming, policy, science, technology | Tags: carbon capture, climate change, climate goal, climate modeling, climate policy, CO2 concentrations, CO2 emissions | Permalink. I read a wildfire article today that was breathless about the scope of total acreage burned across the drought-stricken northwest US and of course included a climate change angle. This is the first wildfire article I’ve read that did not include some mention of decades of ill-conceived fire policies in the intermountain West. Let’s not mince words: a lot of fires are burning on a lot of acres this year primarily because of those man-made policies. Millions of overcrowded acres of forest because people put tiny fires out for decades and allowed trees (fuel) to grow and grow. Fire is a natural process that we purposefully interrupted. Prior years with extensive fires also generated media and environmentalist attention. As I stated above, the difference between then and now is climate activists politicized the science. An EcoWatch article now contains no mention of historical decisions because it is more important to satisfy the environmentalist base by claiming nature is pure without humans and impure with us. This is disappointing but not surprising. For now, I am glad there are more responsible media outlets that continue to acknowledge the very real and dominant influence people have on forests (forest management), the very real and strong influence nature has on forests (drought), as well as the growing influence that people will have on forests in the future (climate change). Categories: drought, global warming, policy, science | Tags: climate change, drought, forest fire, forest management, politicized science, resource management | Permalink.